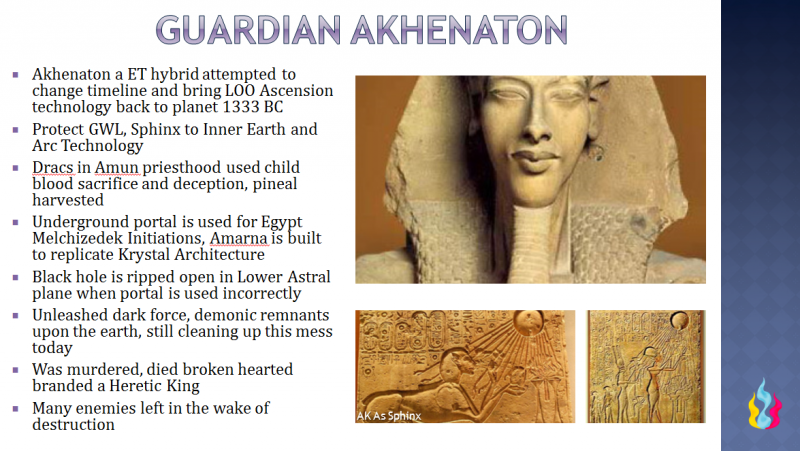 Abbreviation – AK The Guardian previously known as Akhenaton while incarnated, is from the Aton group and is intimately involved with the reclamation of Christos mission, the Paliadorian Activations on the earth. His mission is designed to protect those who are from the ancient original Christos and Yeshua bloodlines, of which he was involved in bringing to the planet, while working with the Azurite teams over 2,000 years ago. He is the original family patriarch as it is his bloodline that propagates in the Krystic bloodlines still today, although much misinformation is still propagated about him to discredit his legacy. Jesus Christ (aka J12) is a Sirian Blue Human from the future that came to change the 3rd dimensional timelines and bring the Essenes, Christos Templars and Law of One Ascension knowledge and its consciousness technology back to the planet earth. He is a direct descendant of Akhenaton’s genetics, as a result he is the father of all Christ lines on earth. This mission was in response to the DNA damage the planet and humanity had most recently suffered after the Luciferian Rebellion, and then the after the Sumerian-Egypt Invasion, which was the final destruction of the Mother’s Staff principle and Aqua Ray in the earth core. His group mission under the direction of the High Lyran-Sirian council was to work with the future earth 5D Taran multi-dimensional Templar crew called the Azurites, originally organized by the RA Confederacy. The disbanded Azurite team is now hosted directly by the Holy Emerald Order. As a team they were working with repairing the planetary architecture, doing Soul Retrieval from the Lemurian Holocaust and Atlantian Cataclysm, preparing the Ley Lines, Planetary Grid Network and Planetary Gates to help align for the ending Ascension Cycle. The collaboration of Guardian teams continues in the next cycle of the Rise of the Paliadorians in order to fulfill the physicalization of the Covenant of Paliador through the reclamation of the Christos-Sophia and Amenti soul rescue mission. In the timelines of Egypt, as well as subsequent abuse of Alien Machinery technology to open portals in the 2D Underworld (which created time and space rips), manifested incredible damage to the planet, and her elemental and nature kingdoms. The damage made to the planetary field created multiple problems with human soul fragments, soul inversion, subconscious shadow personalities and NAA alien manipulation of these vulnerabilities. One of these events was with 18th Dynastic timeline with Akhenaton, a Sirian Annunaki Templar Guardian, of which the erroneous use of opening portal systems for Ascension occurred while attempting to move out trapped souls from the Atlantian Cataclysm and Lemurian Holocaust periods. This ascension project ended in failure and destroyed his massive life’s work in attempting to recreate Krystic architecture and Law of One principles within Amarna, upon the earth. Upon opening rips in the 2D Underworld, which unleashed harmful forces into the higher frequency planes, it fragmented many souls who were sucked through its black hole. Shortly after this event, he retreated from his rule in pain, and was murdered a heretic King. Due to the many, many adventures and relationships we have in this community and across the globe on the importance of Egyptian timelines and with specific reference to Akhenaton who I have spent time with discussing these matters, it feels we need a thread specific to 18th Dynasty and its various intersections.It is 100% clear to me that the Egyptian Black Magic was fortified by A.Crowley, through Thothian magic/alchemy and his work with Merlin archetype energy was foisted upon the Federal Reserve structures and what is still in place today as reversal mechanics around finance, money markets, currency, etc. The 7th ray distortion of Merlin “majic” was placed there to manipulate the financial markets to the benefit of the Nephilim and Controller bloodlines. Because of this entanglement of spiritual mission and purpose, when we draw from the past histories in Egypt we can see clearly we are doing the same work here in this Ascension timeline to repair issues that happened during that time, specific to 18th Dynasty, earlier in the Djoser age going back to the Atlantian Cataclysm. Many of us in ES may feel direct resonance and memory to these timelines as they relate to the current Atlantian Conspiracy. The 18th Dynasty is where many issues occurred that created problems in the planetary grid and crystalline fields which ultimately generated disconnection from certain portals we had open to communicate with the Krystic families. The explosions, distortions in the field destroyed and damaged many of the gates and portal systems on the planet. There are many patterns of “curses, hexes and spells” that come from the Egyptian timeline, many related to the current monetary system. Many of us have very unpleasant memories around the abuse and vivisection of the human brain for the Pineal Glands and hormonal secretion harvesting that occurred during the time of the Egyptian civilization. AK told me he was horrified that the Amun priests would lure serf peasants to give their children up (similar to the Islamic jihad suicide bombers) to be sacrificed and that the Draco priests would collect the Pineal Gland and try different ways to maximize hormonal and chemical secretions. Apparently, the more they terrorized a person, the more pumping of adrenal and pineal hormones, so they would scare the person or the child then open their brain up in order to collect the excretion. According to AK, nothing has changed much in this timeline, as the privileged priests would deceive poor people to believe what they were doing as child sacrifice was considered sacred to the Gods, and the sacrifice would elevate their child and clear their “karma” in the afterlife. This was one big point as to why AK was adamant to switch completely over to the sole worship of the Sun God Ra, and focus on monotheism as this form of religious worship required NO BLOOD SACRIFICES. He was attempting to end child Blood Sacrifice as that was the agenda of the Satanic based Draconian control that had a grip in the Amun priesthood. One can imagine how much the Egyptians hated him for removing their forms of worship towards idols and alien gods, and it was one of the reasons they branded him a heretic and a Psychopath. Pineal Gland activation that connects into the heart complex is getting initiated, which may bring up certain memories from the Egypt timeline during spiritual integration. If this is the case of these painful memories surfacing, hold the observer point, and be as peaceful as possible, do not get sucked into the emotional pain and trauma of these events unless its necessary for emotional processing and needed for completion of conflicts. In the Egyptian timelines, these distortions are linked to holographic inserts where Pineal Cages were placed around the pineal gland as a consciousness trap. Some of us may be dissolving these pineal cages or moving to another stage of clearing these from the lightbody, so for that reason, I place this information here for your consideration and awareness. My exposure to the RA families was being taken through the 14th Gold Ray and 14 D portal sometime during 2005 and then again in 2007 with Akhenaton. I traveled there to the next Universe and we had a group gathering where communication was not verbal but in color wave and code transmission. As many of us can attest, this form of communication feels like getting imprinted with a massive amount of multidimensional language with an incredible amount of encoded geometric information in a few seconds, and it is impossible to express that linearly and in words to give a complete meaning. However, what was impressed upon me up there was that there is a problem with the RA soul extensions in this lower Universe. We are in a phantom section of the Universe, and that there are trapped levels of RA families that are entwined with the Seraphim and Gold Ray issues with the earth and other planets. Think of the infiltration problems with Golden Eagle Grid (GEG) in Iran-Iraq) The Seraphim branches have severe problems with Reptoid, Belial Programs, Melchizedek and other Avian hybrids that created problems with them evolving through alien hybridization and stealing genetics. During Egyptian times a lot of damage was incurred by the lower RA entities who descended further, and some of these extremely negative branches are called Horus-RA entities, and they were working with the control of the Sun and Solar System. Many of them were abducting humans and exploiting them. They seem to have relationships with these Annunaki factions in the Middle East. So in my experience, the RA Confederation is a part of the Guardian Alliance that exists through the 14th dimension in the Seven Higher Heavens and has a major project in finding all their Gold Ray aspects that got lost down in the phantom dimensions, and have reptile hybridization problems. They are linked into the consciousness family of Seraphim so they have all the genetic damage to deal with in relationship to the Golden Eagle Grid, and repairing horizontal grids and the respective timefields. It is a part of our mission in ES to help the Gold Ray and Seraphim Families be retrieved, and have opportunity to heal all of the related issues so they can return home to their families. The RA confederation through the next Universe works with us in relationship to this part of the planetary emancipation gridwork and Ascension Plan B projects that go back to the Covenant of Paliador. There are extensions of this RA family in the lower dimensions, that we do not communicate directly with. This is because they are infiltrated with Reptoid genetics and can leak information back to the Reptoid groups. These are entities that are “feathered serpents” like Quetzalcoatl, and these entities have destroyed themselves through Blood Sacrifice and partaking in these horrific behaviors (think Aztecs, etc). For this reason to denote the RA families outside of this Universe, I refer to them as the RA Confederacy or RA Guardians which consist of many unified groups that has many arms that handle a variety of grid projects related to these issues of the Gold Ray and how they impacted synthetic timelines, and the masculine principle in the lower dimensions. There is a branch of the RA confederacy that administer to rehab Fallen entities that have to face their authority to remove certain quarantines, they are a governing body that decides if a group, individual or family has balanced their power abuses in order to remove quarantines, such as the 666 Seal. Lyran Sirian contact expressed that those responsible to guard and protect humanities genetic records and hidden histories were primarily ambassadors of the Sirian administration councils. The Sirian Lodge is a Hall which oversaw the 6D networks which acted as the portal for Star and Indigo Races to incarnate on the earth plane through the Amenti halls. This Lyran-Sirian administrative body created the Azurite council for the sole purpose of a collective team to support the human embodiment of the Jesus Christ or Yeshua Mission to repair these networks and secure the Amenti field. The Azurites were assigned primary responsibility for the carrying out of the Covenant of Paliador which is to recover the lost souls of Tara. The origination of the Azurites goes back to the races that were formed by the RA Confederacy. The right eye is called the Eye of Ra, symbolizing the sun. The Right Eye of Horus represents concrete factual information controlled by the left brain. It deals with words, letters, and numbers and those things which are describable in terms of sentences or complete thoughts. It approaches the universe in terms of male oriented ideation.